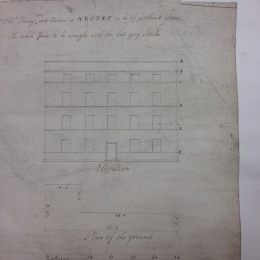 CITE AS: Ben Saunders, "Peopling the Crescent: researching the occupiers of the Crescent 1770 – 1841," in 100 Minories, July 3, 2015, https://100minories.lparchaeology.com/peopling-the-crescent-researching-the-occupiers-of-the-crescent-city-of-london-1770-1841/ [Date Accessed: April 23, 2019]. The ‘Crescent’ today – exists as a 1980s rebuild of one half of the original building. 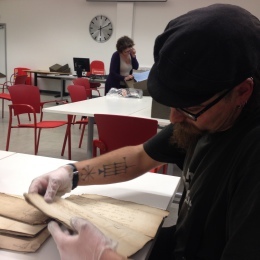 Archaeologist Ben Saunders researching the Crescent and Thomas Wooldridge at the London Metropolitan Archive. In January 2015, L – P : Archaeology excavated two buildings from a Georgian estate, Numbers One and Two, Crescent. This formed part of a larger three-piece estate (the Crescent, Circus and America Square) designed by George Dance the Younger, built by Sir Benjamin Hammet, c. 1768 – 1774. Click the links here to read more in detail about the history of the Crescent and the archaeological enquiry into it. Hand-in-hand with the archaeological enquiry, comes the study of documentary records such as census data, deeds, other written records and pictures. If we are successful this can add voices to the archaeological record. As part of the 100 Symposium (‘The Thomas Wooldridge Biography Project‘), Archaeologist Ben Saunders has been investigating some of these documentary sources to find out what there is to be known about the people who lived in the Crescent. The article which follows here is a brief round up of this research, and constitutes the start of a more comprehensive enquiry into the people of the Crescent. 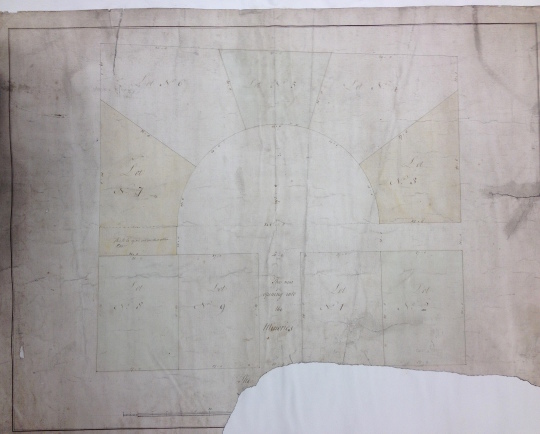 George Dance the Younger’s original plan of the elevation and measured plan drawing. Using records from a wide variety of sources, it has been possible to discover a selection of the businesses and people who occupied the Crescent between approx. 1770 when it appears to have been completed through to 1850. Records are irritatingly scarce for the first 30-40 years. The majority of those that are available can be found in the London Metropolitan Archives (LMA). This resource, based in Clerkenwell, contains a wide variety of city and other official documents, including the City surveyor departmental plans. From these, it has been possible to find out the individuals who were sold the leasehold on the buildings of the Crescent (and the rest of the development) – see figure 1. These individuals bought multiple segments of the developments and then rented them on. A later map of the Crescent from 1790 shows the actual residents of the Crescent, although not all houses are occupied. The LMA also holds some of the fire insurance records for the Crescent, which give names and occupations, particularly around the turn of the 18th/19th Century. These show a variety of people and occupations, with the professionals represented by merchants and corn factors and others being either gentlemen or widows. 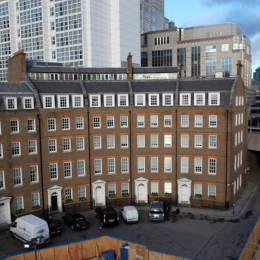 The firm of Robert and John Wilson, Corn factors, is first recorded at 2 Crescent in 1808, and continued to occupy that property until at least 1841. Joseph Bishop, a merchant and philanthropist, lived and worked out of 1 Crescent from 1824 to 1841 while a series of gentlemen were also present (George Irving, 5 Crescent 1810-1818, Lewis Raphael (8 Crescent 1825-1841) and Thomas West (6 Crescent 1828-1839). The latter of these was a solicitor who formed a partnership with James Morris of 12 Crescent who operated between 1828 and 1842. Figure One: Land of the Crescent, divided into lots. These two early resources give a vague idea of the make up of the Crescent. There are at least two Jewish merchants (Isaac Sapertas and Samuel Moses at 5 and 9 Crescent respectively) as well as Antony Calvert. Calvert was one of the three directors of Camden, Calvert and King who had their head offices at 11 Crescent, with two counting houses and a warehouse behind (Sturgess and Cozens 2013: 175). They were the largest slave trading company registered in London at this time, although they had diversified into whaling, general trade and contracting for the infamous second and third fleets of convicts sent to Australia. The house was also used as a prize office, with several of the company’s ships being fitted out as privateers at various points during the American War of Independence and the Anglo-French Wars of the 1790s. Calvert lived above the offices, as well as having a larger house in Broadstairs to watch his ships coming in. He, along with King was a member of the Elder Brethren of Trinity House, and known as a hard nosed businessman. The company had agents in Ostend, Cape Coast Castle on the Gold Coast and Bombay, and hired their ships to the East India Company and the Royal Navy. This presence of this company shows the presumed respectability of the area, as well as the convenience of the location close to the docks and close to Trinity House. After Calvert’s death in 1808, 11 Crescent was sold. I suspect that the two counting houses became 12 and 13 Crescent, as there is no mention of these properties before this date, while they are frequently mentioned after, particularly in bankruptcy notices. Other merchants and shipbrokers present at this time include James/John Douglas (4 Crescent) and Elyard and Price, shipbrokers (2 Crescent). More names and companies linked to the Crescent have been discovered by combing the bankruptcy notices present in the London Gazette. This chronicle has published information, marriages, deaths and other notices since 1665 in some form. Annoyingly it rarely gives a house number, with the majority of individuals only ‘of the Crescent, Minories’. However it does add more names and professions to the population of the Crescent. 12 Crescent appears to have been a particularly unfortunate address for merchants and traders with six merchant companies (4 Wine and beer merchants, 1 bonded stores and 1 china and glass merchant) being declared bankrupt at this address between 1853 and 1871. This resource is useful but care must be taken to note the correct year, as multiple bankruptcy notices were advertised, sometimes over 5 years or more in the case of James Mitchell, until the case was settled. Thomas Wooldridge, a merchant and alderman of the City, who lived at 11 Crescent, had bankruptcy notices against him posted between 1777 and 1802, despite his death in 1795. Some of his notices are more useful as they give his address as either Clerkenwell or King’s Bench debtors prisons, showing an interesting fall from grace that is expanded on elsewhere in this series of articles. The data also shows the harshness of bankruptcy at this time. A large number of the bankruptcy notices are followed a couple of years later, by a notice of death, such as in the case of Richard Willis, 1 Crescent, who was declared bankrupt in 1778 (the same year an advert for him appears in The Gentleman’s Magazine, Town and Country Magazine and The Lady’s Magazine-clearly too much advertising can be a bad thing) and then dead by 1780. The London Gazette also carries information about the creation and closing of companies and from these notices we see a number of probably Dutch and Germanic merchants such as van Dyck, Gevers & Co, De Bie & Rahn and John Bruhn Suwerkrop being established or wound up. Other useful resources available include Post Office directories (1808 and 1843) and Kent’s Directory of businesses (1823, although the British Library does apparently hold copies for other years which I have sadly been unable to attain). The Post Office directories compliment the idea of a maritime mercantile business district, with merchants present in the Crescent in 1823 while the Circus (part of the same development to the South but made up of smaller buildings, made up of brokers and ship agents (De Bie and Rahn Ship Agents, Vink Brokers), as well as the Hanover Consular office. An over-riding idea of the population of the new development is that of foreign merchants and those connected with the sea, alongside a large Jewish and non-conformist population. In 1841, the only year where a near complete identified population is recorded, there are three Jewish merchants working/living in the Crescent, alongside ship agents like Hans Jonas Lindgren. The Germanic and Dutch immigrants are well attested to have settled in the East End during this period, and it appears that, along with some wealthy Jewish businessmen, the more successful have settled in the Crescent. Neither of these groups would have had much political clout, due to either their religion or their origin but they were able to trade and so buy a level of respectability. It is unfortunate that the census for the mid 19th Century for the Crescent is either lost or incomplete. 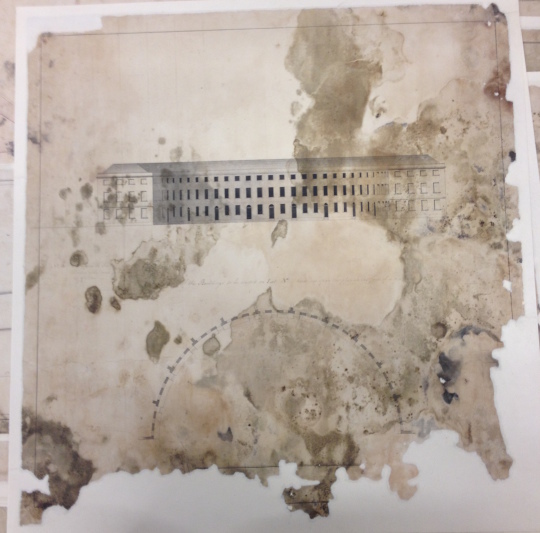 Having searched the documents at the National Archives, I am currently unable to find the 1841, 1851 or 1861 data. This would be useful, but in comparison with the amount of data available through other means, particularly as it would only register those occupying the buildings rather than the businesses operating from them, it is a small loss. There is so much out there anyway. Sturgess, G. and Cozens, K. 2013. Managing a Global Enterprise in the Eighteenth Century: Antony Calvert of The Crescent, London 1777-1808. The Mariner’s Mirror 99. 171-195. PD-ART – ‘That Accounts for It’ (1799) by Isaac Cruikshank.